Enlisted aged 20 years on May 12th, 1861 at New York City. Mustered into Co. A as a Corporal 30 June 1861 for a three-year tour of duty. 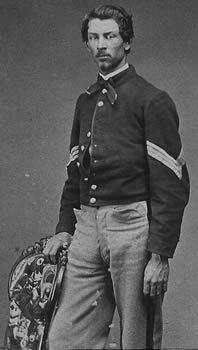 Promoted to Sergeant 26 August 1861 and re-enlisted as a veteran 5 February, 1864. Wounded in action 5 May 1864 at the Wilderness, VA., and died of his wounds 9 May 1864 at Fredericksburg VA.